large studio, W/private entrance with A/C, perfect for 2 Adults. State of Hawaii Transient Accommodation Registration: W40799764-01. have been rated among the best beaches in the USA. Some of Oahu's best hiking trails are also in close proximity to our location. Swim with the green sea turtles. Kayak or sail to one of the secluded offshore islands to enjoy the best Hawaii has to offer. Located only a few houses from beautiful Kailua Beach Park. This tastefully decorated studio with it's full kitchen, and queen sized bed, provides the perfect vacation spot in paradise. With more than 20 years of Kailua residency, your hosts will gladly suggest sights and adventures to help you have the very best vacation possible. Grew up in Europe, Asia and Manhattan beach, California. 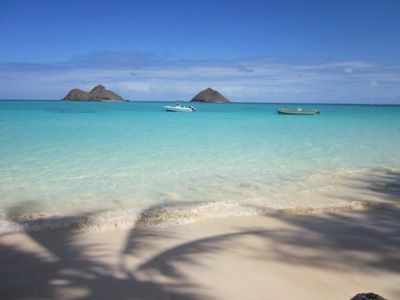 Traveled extensively and chose Kailua, Hawaii to live the past 47 years. We can offer great suggestions on where to go, what to do, and how and when to enjoy the myriad of activities and sights. It is Brand New with everything a cute and comfortable cottage should have. Onsite parking, A/C and a lovely lanai with mountain views. It is in a PERFECT location to enjoy so much that Kailua has to offer. Our cottage has a huge lanai, with a front yard all your own capturing the balmy trade winds, sunrises and sounds of birds to awake your senses. It is bright and tastefully decorated to make you feel at home. After a hot day at the beach, you can come home to air conditioning to cool off and more importantly get a good nights sleep. Large walk-in Shower; accommodates two adults. A/C to be used only when guests are in the cottage. Must be turned off upon leaving for the day. Rick and Nancy have established a very nice rental unit and did not compromise on quality as this would be a reflection of their own high standards. The only thing was when you click on VBRO for directions it say 150 meters from the beach and as it turns out that distance is not correct. This may not be an issue as it puts you an equal balance from town center and the beach but just to be aware. Rick and Nancy are very quick to fix any issues. Would book again to complete more hikes and exploring. Rick and Nancy provide a wonderful experience at their Kailua vacation cottages - the location is beautiful (just a short walk to either the beach or downtown Kailua), the cottages are tastefully furnished (with a full kitchen!) for both the short or long visit, and the hosts themselves are friendly and helpful. Everything you could want for a quiet beach getaway is available at Rick and Nancy's cottages - I could not have found a better place to stay. Amazing room, great location, and friendly owners! Nancy and Rick went above and beyond making our stay fantastic. The studio was very comfortable, and the full kitchen helped. There were buggy boards available for us to use, plus chairs. The walk to the beach is 2 minutes, which made life easier not having to find parking at the beach. Would highly recommend this studio for its location and the friendliness of the owners, Rick, and Nancy. My husband, daughter, son and I recently stayed at Rick and Nancy's home last week and we had a great time! Rick was extremely welcoming and helpful during our stay. We really enjoyed our time and definitely would recommend all of our family and friends to stay here too. Nancy and Rick's place was very clean and well-stocked. The appliances are clean and new - including the shared high end washer-dryer. It was even more private than we anticipated - during our week there we barely noticed that other people were in the vicinity. The place is an easy walk (maybe equal to 3 east coast beach blocks) to the beach or to food and grocery in town. If you use their bikes, it is even easier. We made a few trips into Honolulu and around the island for hiking and we thought that this apartment was perfectly located for exploring. We used their beach chairs every day - Kailua beach is the best beach we've ever visited. We are city people and didn't really notice the traffic on Kailua Road - it is a slow speed road and is lightly traveled outside of beach times. I would recommend Nancy and Rick's place - and their advice about Oahu - to anyone without reservation. Thanks for offering such a comfortable and easy place to stay. I sure hope we see you again next year! What a nice review regarding your stay with us. It is a positive reflection of who you are and the appreciation you have for what Kailua and our location have to offer. It was a real pleasure having you as our guest and we wish you happy trails in your future adventures. Rick and Nancy were gracious and accommodating hosts for my wife, my 9yo daughter and myself. The place exceeded all of our expectations. The fit and finish of the residence were superior to what the pictures might suggest. Yes, a seperate bedroom might have been nice, but I still feel that we were fortunate to have chosen this place. The location was a pleasant 8 minute walk to the most amazing beach. I don't recommend places easily but for this place I simply must. Beaches, shopping, hiking, golfing and marine sport activities all within short walking distance of our location. An additional $100.00 cleaning fee is added to each reservation stay.